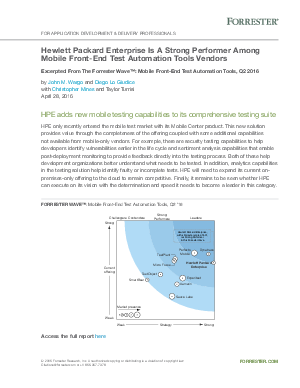 Hewlett Packard Enterprise is a strong performer among mobile front-end test automation tool vendors. HPE only recently entered the mobile test market with its Mobile Center product. This new solution provides value through the completeness of the offering coupled with some additional capabilities not available from mobile-only vendors. For example, there are security testing capabilities to help developers identify vulnerabilities earlier in the life cycle and sentiment analysis capabilities that enable post-deployment monitoring to provide feedback directly into the testing process. Both of these help development organizations better understand what needs to be tested. In addition, analytics capabilities in the testing solution help identify faulty or incomplete tests. HPE will need to expand its current on-premises-only offering to the cloud to remain competitive. Finally, it remains to be seen whether HPE can execute on its vision with the determination and speed it needs to become a leader in this category.